On the first of November, KT got really excited. She told us all that it was almost Thanksgiving and she couldn’t wait for it to arrive. We were a bit puzzled as she doesn’t usually get overly excited about any holiday, let alone Thanksgiving, so naturally we asked her why. We half expected our maturing young lady to mention something about counting her blessings or to gush about all the things she was grateful for (Hey, it could happen!) We weren’t terribly surprised to find out that it wasn’t any of these things. We were, however, surprised to find that she was most excited about the prospect of dining on Tofurky again! We told her that she could have it at other times of the year, but she refused that idea. Apparently, Thanksgiving is the only time she can eat the stuff. She always was an odd child…takes after her father of course…. 7 Responses to Happy Thankgiving! I don’t know if I could bring myself to even try something like that! 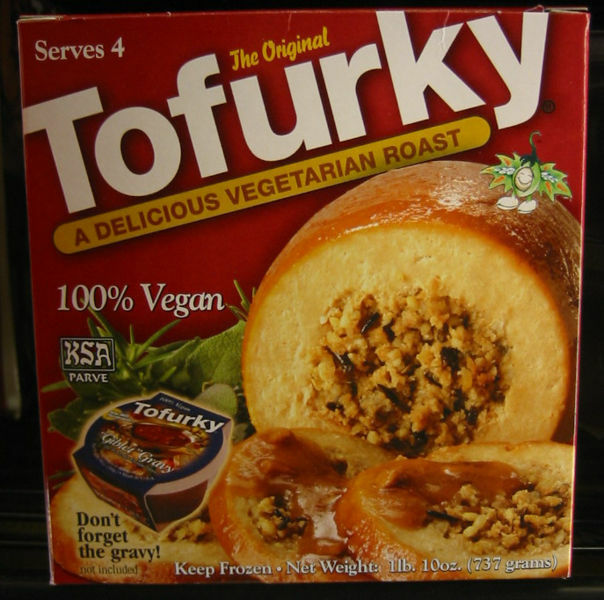 I don’t think I’ve ever heard of someone liking Tofurky before. Points for not typoing it. 😉 Have a great one, Susan. I am happy that there is a substutite (Turkey) for Kt! I am looking forward to seeing her eat it! Happy Thanksgiving to all of you out there. I don’t know why but I busted out laughing at the “Don’t forget the gravy! (not included)” on the box. I’ve yet to try that. I’m going to hunt it down, shoot it, and bring it home over my shoulder.